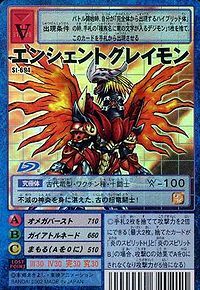 Possessing the attribute of "Flame", it is one of the legendary Ten Warriors Digimon that saved the ancient Digital World. An Ultimate who existed only in the distant past, it is told that its strength surpasses that of current Ultimates, and it is certainly an "Ultimate" being. 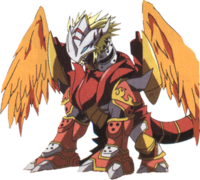 Ancient Greymon's abilities were later passed on to the "Dragon Digimon" of the Greymon-species. 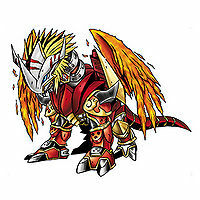 It is said that in the previous crusade, it survived to the end alongside Ancient Garurumon, and sealed away Lucemon. Its Special Moves are gathering the spirit of the land and creating a tornado to swallow up the opponent and blow them away (Gaia Tornado), and inducing a super-detonation over the surrounding kilometers with an intense flash (Omega Burst). 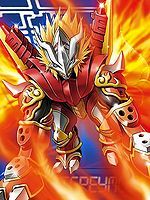 Title: 「伝説の火の闘士」 — "Legendary Warrior of Fire"
「火焔の古代竜」 — "Ancient Dragon of Flame"
Omega Burst  オメガバースト Omega Bāsuto Omega Corona Induces a super-detonation for kilometers around with an intense flash. 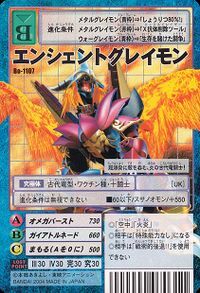 Gathers the spirit of the land to create a tornado that swallows up the opponent and blows them away. 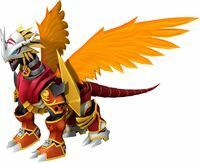 Ancient Greymon from Digimon Frontier: Revival of the Ancient Digimon!! 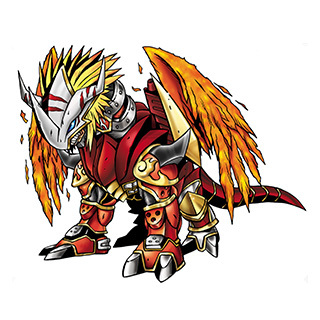 Ancient Greymon is one of the Legendary Warrior Ten whose spirit was reborn in the Human Spirit of Fire to create Agnimon and the Beast Spirit of Fire to create Vritramon. 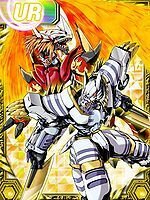 Ancient Greymon somehow revives to battle against Ornismon alongside Ancient Garurumon. 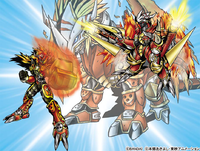 Ancient Greymon appears when a jogress is used in battle to switch a Diablomon and an Imperialdramon: Paladin Mode. 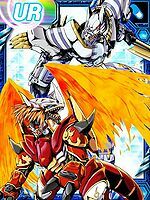 Ancient Greymon appears very briefly whenever Takuya uses the Ancient Spirit Evolution attack. 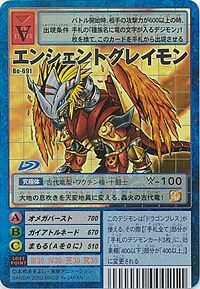 Ancient Greymon can only be obtained as a collectable card. 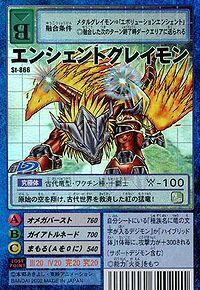 Its card is part of the Warrior Ten (十闘士 Juttoushi) set and the Ultimate Greymon (究極体グレイモン Kyūkyokutai Gureimon) set. 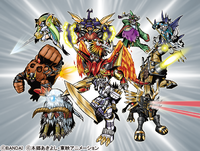 Ancient Greymon is available as a Digimon Medal. 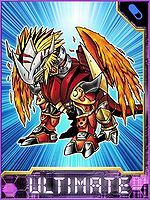 Ancient Greymon can only be obtained as a collectable card. 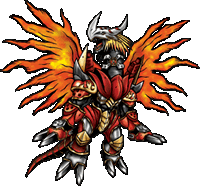 This ancient, super dragon warrior has filled its body with immortal, divine flames! 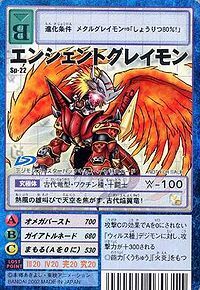 Soaring the primal skies, this fierce crimson dragon helped to save the world of ancient times! This fiery Ancient Dragon changes the breath of the earth into a cataclysm! 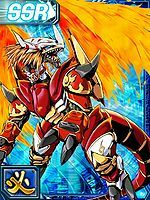 This ancient dragon fighter of fire engulfs the enemy in super explosions! This ancient dragon sports flaming wings, scorching the skies with its heatwave war cry! This page was last modified on 5 April 2019, at 06:22.